BikeCommuters.com > Commute > Another bike vacation/adventure! Many readers know I’m a big advocate of combining your vacation with bicycling. I just got back from a mini bicycle adventure, without ever once having to drive a car! Our trip started simply enough on the Amtrak bus. Notice how we’re the ONLY ones on it 🙂 I’m afraid it won’t always be the case. The first part was easy enough. 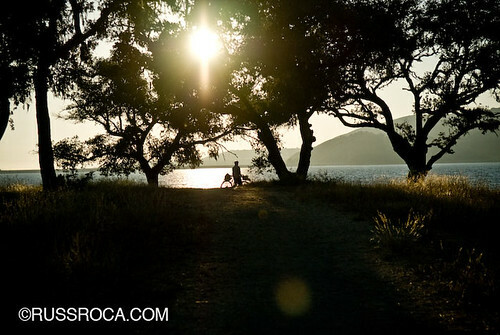 Take the train from LA to Goleta and ride to El Capitan state beach and camp. The amazing thing is, within six hours we were out of Los Angeles, had ridden a coastal stretch of the 101 and were now setting up camp! This makes a great little S24O and you can turn around the next morning. We, however, were masochists and decided to turn it into an adventure. We took San Marcos Road to the 154 to Lake Cachuma. It was a relentless non-stop climb that lasted for about 3.5 hours! Neither of us had climbed anything like that before so needless to say, it was an experience! There was literally no flat stretch or dip until the lake. The lake itself was great and the campsite was quiet-ish and we had the hiker/biker site all to ourselves. 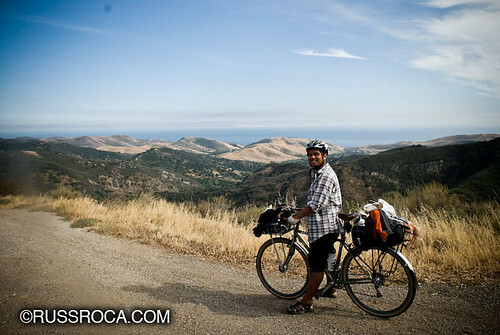 The next morning, we headed towards the coast, which meant having to climb the Santa Ynez mountains again! 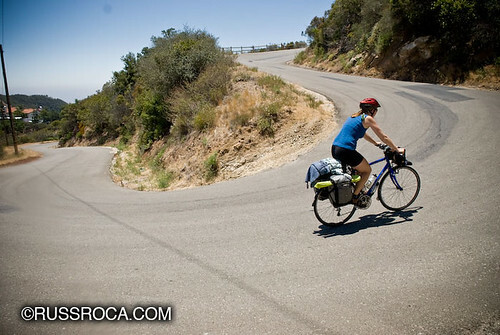 We took a little squiggly road on the map called Refugio Road. What we didn’t anticipate was that most of it would be nearly unrideable! 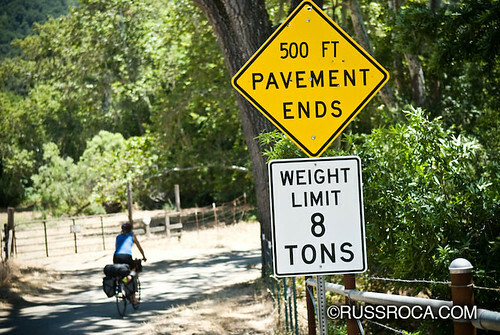 The road was a literal rock garden with some pitches of 20% grade on loose sand, gravel and rocks the size of two fists. We rode where we could and walked when we couldn’t. We saw two cars that entire stretch and both were 4 wheel drive. We did manage to make it to the top where the road was under a different county jurisdiction because it was actually paved! The downhill was fast and furious. We had to dump about 2200 feet in 7 miles. We stopped many times going down to take photos and to let the rims cool! 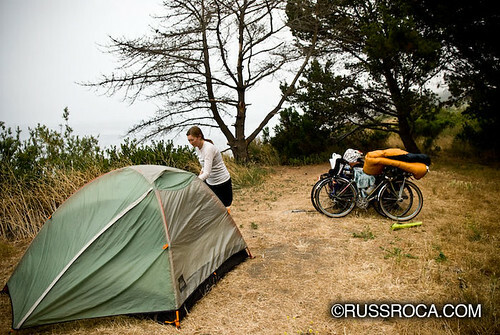 After all that we made it to Refugio State Beach, which had the best hiker/biker site of the trip. Right next to the ocean and right next to the showers. It made all the hurt worthwhile (almost). Now we’re back and we’re scheming our next trip. 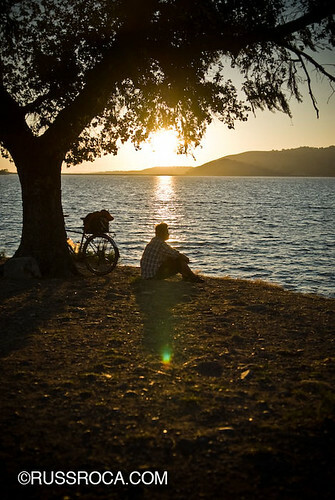 Hope this inspires some readers to take a bike journey of their own. 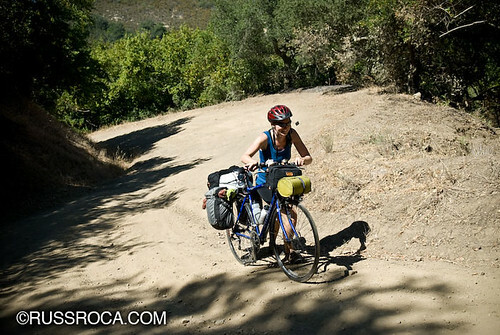 A great source for maps and general touring information is Adventure Cycling, so check them out. They put out a great magazine filled with ride accounts and reviews. Wow, what a great trip. Thanks for posting that. Damn..that looks like a real good time. Thanks for sharing. 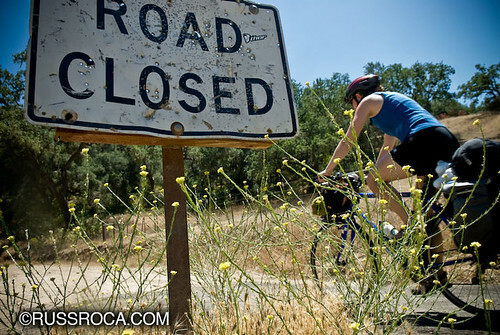 Can’t believe you guys rode up that grade to Lake Cachuma, Russ. That is one loooooong grind! Ooh thanks for the heads up on Adventure Cycling! Just ordered a sample issue and I’m sure a large portion of my evening will be lost to browsing their site. I have a love/hate relationship with Adventure Cycling’s magazine. I very much want to do bike tours such as they describe but am in no shape physically, financially or personally. (Leave my wife and three year old for a month? Hello divorce!) I like their concept and aspire to meet their goals. Russ: Nice images but what is with the light falloff in the corners? Is that a problem with the lens, camera or is that a deliberate effect? I find it very distracting. That aside, nice article. That is exactly the sort of ride about which Adventure Cycling should write. Lance…yes…it was a looonggggg grind up the hill…. 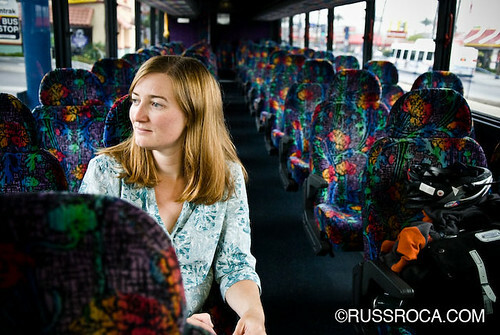 PBBT – I feel the same…I think short tours breed long tours…that’s why I’m a big advocate of the S24O…. I do a little lens vignette…remnants of when I use to print BW and I would burn the edges…keeps the eyes from crawling off the page..
Wow! Nice shots with the scenery! I love watching your happy faces bicycling along the road. Im sure you have a pretty nice camera band to get these pictures lively captured.